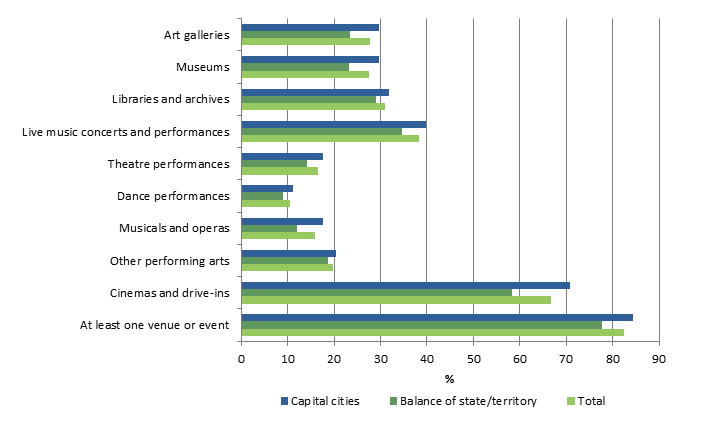 The findings provide statistics on attendance at museums, galleries, libraries and archives across Australia in relation to age, location, gender and socio-economic factors. Both sets of statistics can be downloaded from the ABS website. During the 12 months before interview in 2017-18, most Australians aged 15 and over attended at least one cultural venue or event (82.4%). Over the same period, most Australian children aged 5-14 years attended at least one cultural venue or event outside of school hours (94.3%) .